Jessica Jones is a registered dietitian with a master's degree in nutrition. Jones has worked as a clinical dietitian at Kings County Hospital in Brooklyn and as a senior nutritionist for the NYC Department of Health. She currently co-hosts Food Heaven Made Easy (www.foodheavenmadeeasy.com), a healthy cooking and nutrition webseries. The California native received a Bachelor of Arts in journalism from San Francisco State University, and has penned hundreds of articles about food, health and culture for publications like the "Village Voice," "Time Out New York," "amNew York" and "Today’s Dietitian." Tasty olive oil is produced primarily in Mediterranean countries -- such as Italy, Spain and Greece -- and is consumed by people around the world. The flavor of olive oil depends on many factors, including climate, soil and how the olives are harvested and then pressed to produce the oil. Extra virgin olive oil is derived from the whole olive fruit -- also known as a drupe -- using the cold-press technique. The process of making extra virgin olive oil does not change the chemical nature of the olive or the oil produced. This is beneficial because compounds developed by the fruit from environmental stress are incorporated into the oil. Some of these phenolic compounds have been shown to have antioxidant effects in humans, specifically reducing risk for atherosclerosis and cancer, as well as providing anti-inflammatory and antimicrobial benefits. Extra virgin olive oil is calorie-dense and falls into the fat food group. One tablespoon of extra virgin olive oil contains 119 calories and 13.5 grams of fat, which is 21 percent of the recommended daily value based on a 2,000-calorie diet. Extra virgin olive oil does not contain any protein or carbohydrates. 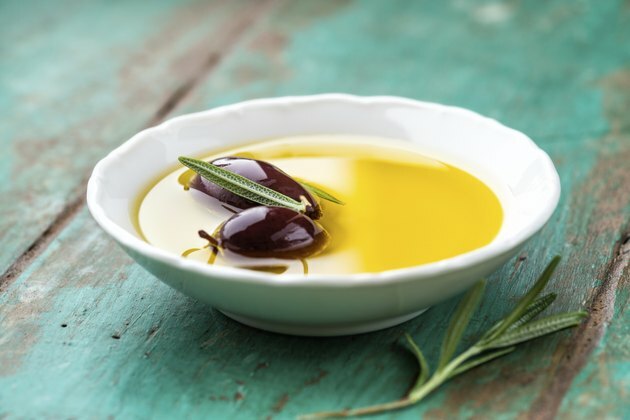 About 75 percent of the fat from extra virgin olive oil is monounsaturated, a type of oleic acid that has been shown to decrease total blood cholesterol. Extra virgin olive oil has many health benefits. Oleocanthal -- one of the compounds found in extra virgin olive oil -- has been shown to have anti-inflammatory properties. For example, a study published in "Nature" in 2005 found that when participants consumed 4 teaspoons of olive oil per day over 12 weeks, the oil mimicked an anti-inflammatory drug when it came to reducing pain. Extra virgin olive oil may also play a role in reducing the risk of heart disease as well as combating diabetes and promoting healthy fetal development. Some researchers take issue with the use of extra virgin olive oil in cooking. A study published in "Food Research International" in 2013 found that because olive oil has a relatively low smoke point when cooked, some of its nutritious properties start to degrade at high heats. For example, when olive oil is heated to a temperature above 375 degrees Fahrenheit, its phenols -- which function as antioxidants and have heart-healthy effects -- break down. Because extra virgin olive oil can cost two to 10 times the price of canola oil, the study's authors recommend saving it as a final seasoning on cooked foods. Phenolics.Org: What Are Phenolic Acids? Is Lemongrass Essential Oil Good for Lowering Cholesterol? How Is Emu Oil Made?